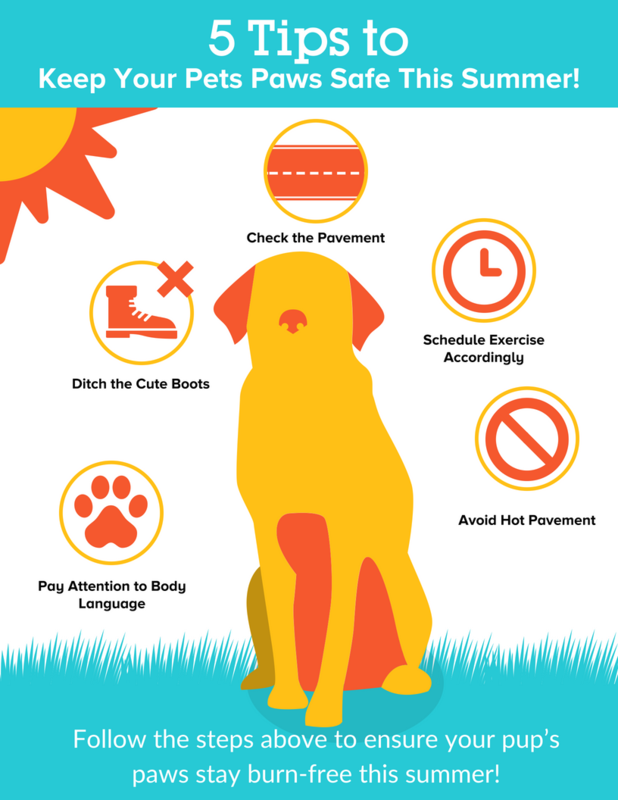 5 Tips to Keep Your Pets Paws Safe This Summer! Before every walk, place the back of your hand on the pavement for 7 seconds to test the heat. If it’s too hot for you, it’s too hot for your pup! If your dog needs exercise, reserve walks for early in the morning before the sun is at its hottest, or later at night after the sun has gone down. Never walk during the hottest part of the day. If your dog is refusing to walk, limping, or refusing to sit, the ground could be too hot. Remove your dog from the hot environment, check for burns, and seek medical help if you see anything unusual. Look out for excessive licking or chewing of paws, or darkened skin pads- these could indicate burned paws. We know dog booties are super cute, but dogs cool themselves by sweating through their mouths and paws. Booties will just trap heat in. Resist the cuteness, and follow the steps above to ensure your pup’s paws stay burn-free this summer!